The Whole Person (TWP) is an organizational member of the United States Tennis Association and offers the fun and exciting sport of wheelchair tennis. Wheelchair tennis is one of the fastest growing recreational and competitive sports for people with disabilities, and is becoming one of the most accessible and integrated sports around the country. The Whole Person’s goal is to make tennis available to everyone, whatever the disability. Tennis is adapted to the disability, not the disability to tennis. Because playing tennis benefits one’s health, fitness, self-confidence, self-esteem, and even provides improved mobility necessary for independent living, TWP promotes tennis in the greater Kansas City area. Come join us on the courts for fun, friendship, and fulfillment. There are two divisions in competitive wheelchair tennis - paraplegic and quadriplegic. To be eligible to compete, a player must have a medically diagnosed permanent mobility related disability that result in a substantial loss of function in one or both lower extremities. Competitive tennis in the paraplegic division is divided into four divisions. C division for beginners, B division for intermediate, A division for advanced, and the U.S. Open division for elite players. Competitive tennis in the quadriplegic division is divided into two division. A division for beginner/intermediate and U.S. Open for advanced/elite. Currently the No Coast Wheelchair Tennis Team has athletes in the paraplegic divisions who compete in the C, B, and A divisions in tournaments all over the Midwest. 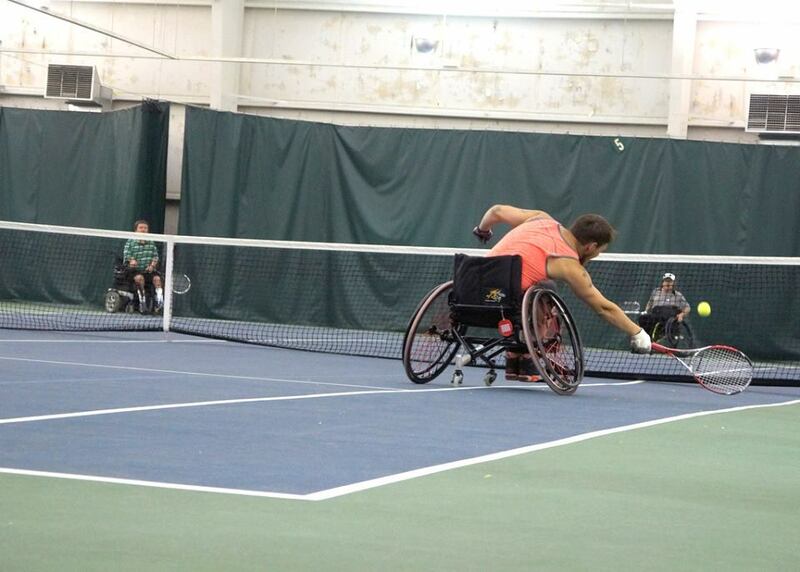 Wheelchair tennis follows the same rules as able-bodied tennis, with one exception. That being, the wheelchair tennis player is allowed two bounces instead of one. Contact Rick Haith if you are interested in playing wheelchair tennis at the recreational or competitive level.